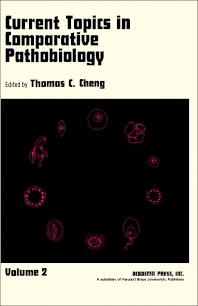 Current Topics in Comparative Pathobiology, Volume 2 covers several areas of pathobiology. The book discusses the biology of trematodes of the genus Paragonimus that occur in the Americas; the milky disease of beetles; and the biochemical exploration in insect pathology. The text describes the application of invertebrate tissue culture to the in vitro study of animal parasites; and the use of hydra-hydramoeba as a model system for the study of epizootic processes. The aspects of the biology of nudibranchs are reviewed, with emphasis on nudibranchs as members of associations, including functional morphology, physiology, utilization of host pigments and nematocysts, life history, behavior, defensive mechanisms, and ecology. Chemists, bacteriologists, parasitologists, invertebrate pathologists, immunologists, and protozoologists will find the book invaluable.